To be successful, every marketer needs a game plan – a strategic collection of plays that will help you score points with your audience and produce winning results for your brand. Having a documented content marketing strategy is always your smartest opening move, as it helps you clarify your brand’s strengths and opportunities, and ensure that your team’s players are all working toward the same goals. But once you’ve defined your strategic direction, there’s still the matter of picking the content marketing tactics you’ll use to tell your brand’s stories and position them for optimal success. With so many content formats available – each with its own particular strengths and limitations – it’s not easy to figure out which ones will work best for your business. For example, have you ever considered your answer to any of the following questions? Which content creation techniques will help get our point across with those in our audience who prefer skimming to reading? Are there certain formats that require more resources, technical expertise, or maintenance than others, and are they worth the extra effort? Which tactics work better when we have an emotionally charged story to tell, or need to discuss a sensitive issue with customers? Are there formats that are easier to repurpose, helping us get more value out of our marketing spend? 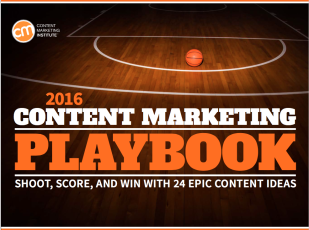 If finding the right format for communicating at the right time and place is something you struggle with, we have a new resource that can help: The 2016 Content Marketing Playbook: 24 Winning Tactics. Not only does this year’s playbook provide a snapshot of each technique’s value proposition, it also reveals key industry insights, offers ideas to help with content creation, and highlights essential considerations for achieving success with the tactics you select. We’ve done the prep work by detailing over 24 plays. Now, you can study them to create your brand’s content marketing playbook. Game on. If you are looking to learn even more about working with content marketing tactics like these, enroll in the content marketing industry’s premier online education and training program – CMI University. Sign up now to secure your spot before our next semester begins.